Francis, the leader of the world’s 1.2 billion Roman Catholics, has regularly urged the faithful to be more spiritual and his priests and bishops to be humbler. When technological revolution started years ago, no one thought the bug would catch-up with catholic clergies. During masses, they will also be snapping pictures with their cell phones. But on Wednesday, the Catholic Pontiff, Pope Francis, would have none of it any longer. He chastised priests and bishops who take pictures with their cell phones during Masses, saying they should focus on God instead. "The priest says 'lift up your hearts'. 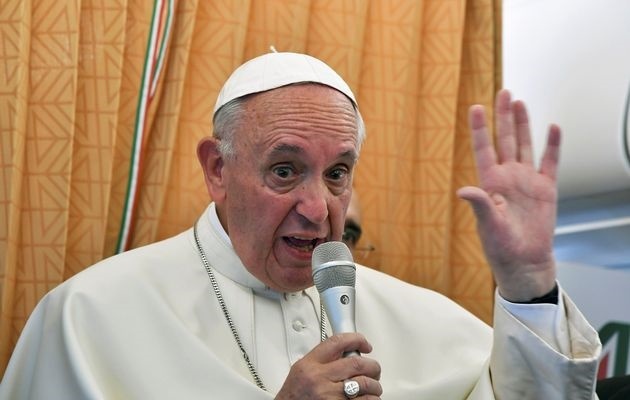 He does not say, 'lift up your cell phones to take pictures," Francis told tens of thousands of people at his weekly audience in St. Peter’s Square, referring to a communion prayer in the Roman Catholic Mass. "It makes me very sad when I celebrate (Mass) here in the piazza or in the basilica and I see so many cell phones held up. Not only by the faithful, but also by some priests and even bishops! "The Mass is not a show ... so remember, no cell phones!" he said, prompting laughter and applause from the crowd. Francis, the leader of the world's 1.2 billion Roman Catholics, has regularly urged the faithful to be more spiritual and his priests and bishops to be humbler.